Offer condition: Offer applies to selected CDA, Rangemaster, Smeg, Napoleon, Falcon, Britannia and Bertazzoni products. Certain exclusions apply, as indicated on the website. Offer condition: Offer applies to Falcon, Faber and Verine. Excluding Agency/Euronics products. While stocks last. Not to be used in conjunction with any other offer (including cashback). Offer condition: Offer excludes appliances valued under £100. Offer excludes small appliances. thegassuperstore offer this service in conjunction with other promotions onsite. To qualify for the offer your appliances must be placed on the same order. There is a maximum limit of 6 appliances per order. Trade customers are excluded from this offer. thegassuperstore reserve the right to remove this offer at any time. thegassuperstore are under no obligation to honour any multi-line orders placed outside the scope of this offer. Offer condition: Offer applies to Bertazzoni and Britannia Cooker Hoods only. Voucher codes applied at checkout. Offer condition: Offer applies to selected products only. Offer condition: Website terms and conditions apply. Offer condition: Offer applies to Lec, Hotpoint, Panasonic, Neff, Siemens, New World, Bosch, Aga, Stoves, Indesit, Belling, Valor and Hoover products only. Do not miss another The Gas Superstore voucher! Simply leave your e-mail address and we'll always keep you informed of new vouchers for The Gas Superstore. Offer condition: Offer excludes appliances valued under £200 Offer excludes small appliances. We offer this service in conjunction with other promotions onsite. To qualify for the offer your appliances must be placed on the same order. There is a maximum limit of 6 appliances per order. Trade customers are excluded from this offer. We reserve the right to remove this offer at any time. We are under no obligation to honour any multi-line orders placed outside the scope of this offer. Offer condition: Offer applies to Lec, Hotpoint, Panasonic, Neff, Siemens, New World, Bosch, Aga, Stoves, Indesit, Belling, Valor and Hoover products only. Excluding Agency/Euronics products. While stocks last. Not to be used in conjunction with any other offer (including cashback). Offer condition: Usual website terms and conditions apply. Offer not to be used in conjunction with any other offer or voucher code, including cashback. Offer condition: Usual website terms and conditions apply. Offer not to be used in conjunction with any other voucher code or offer, including cashback. Offer condition: Only applicable for selected Bosch and Siemens appliances. We reserve the right to end the offer at any time. Offers not available for Agency/CIH products. Limited availability. Offer condition: Offer applies to Bertazzoni products only. Voucher code can be applied at checkout. Offer condition: Offer applies to Falcon products only. Apply voucher code at checkout. 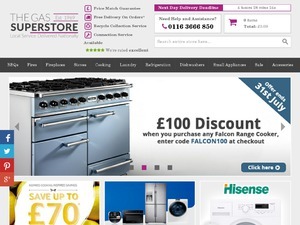 £10 Off selected Hotpoint, Fridgemaster, Rangemaster, Baumatic, Hoover, Indesit, Panasonic and many more! Offer condition: Usual website terms and conditions apply. Offers and vouchers not to be used in conjunction with each other, including cashback. Rangemaster Half Price Hood when bought with a Rangemaster range cooker. Selected Rangemaster hoods and ranges. Offer condition: Offer applies to selected products only. Voucher code applied at checkout. Offer condition: Offer applies to selected products only. Voucher code to be applied at checkout. Offer condition: Offer applies to wine coolers only. Voucher code applied at checkout. Latest voucher code valid at a time of promo publication was entered to be working from 2017-01-13.